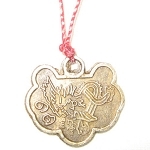 This 4 inch Convex Bagua Mirror is a powerful and useful Feng Shui tool. It is a convex mirror framed by a wooden Bagua. 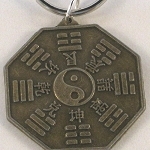 The Bagua is an eight sided energy tool which surrounds the mirror with eight trigrams (ancient Chinese symbols that increase protection from negative energy). The convex mirror deflects negative energy away from your home or business. This negative energy blocking mirror is an especially useful tool to protect against extreme cases of negative energy (like violent neighbors, threats or illegal activity). Remember that this mirror is an ancient Feng Shui cure and is very powerful! It is mandatory to hang the Bagua Mirror on the outside of your building, over the front door, with the mirror facing out, away from your building. PROTECT YOURSELF FROM DANGEROUS NEIGHBORS!